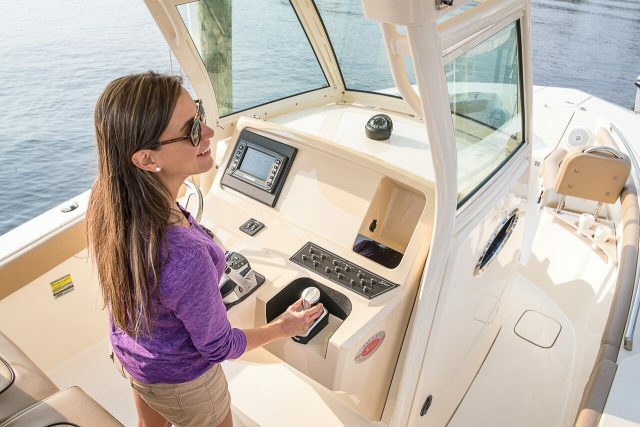 Evinrude has announced the launch of a revolutionary joystick system that instills 360-degrees of confidence when docking your boat – the Evinrude iDock joystick piloting system. 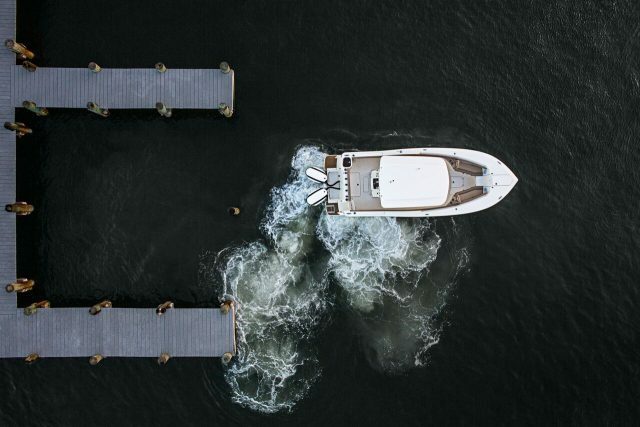 Available on boats with twin Evinrude E-TEC G2 150 to 300 HP engines, the new intuitive, integrated and attainable system is designed to make easy-to-use joystick technology available to more boaters. 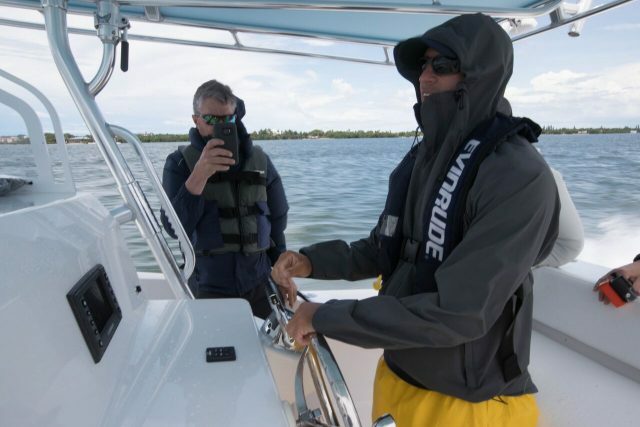 Evinrude iDock allows users to easily maneuver their boat using a joystick for simple docking in even the toughest conditions. The joystick system lets users to side step the boat or pivot in place with control at their fingertips. Advanced aircraft gyroscope sensor technology makes iDock more intuitive to pilot by automatically compensating for wind and current. If extra power is needed to overcome wind or current, boaters can simply push the stick further into boost position to double the thrust. The simplicity of the system requires much less time to become accustomed to, thus creating a more positive first time boating experience. Capt. 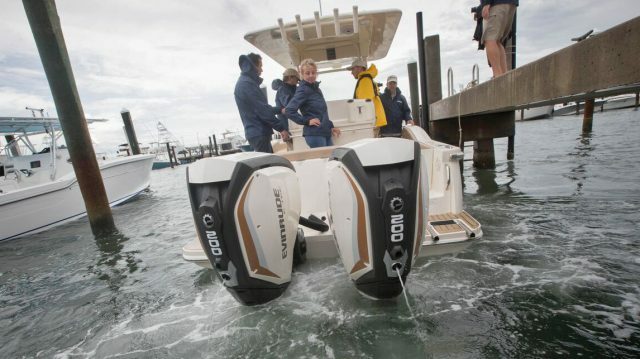 Rush ran an Ocean Master center console with twin 300 HP G2 E-Tec outboards at a recent media event at the Hutchinson Island Marriot Marina. The winds were really gusty from nearby storm clouds. Evinrude had several styles of boats on which to test the iDock. 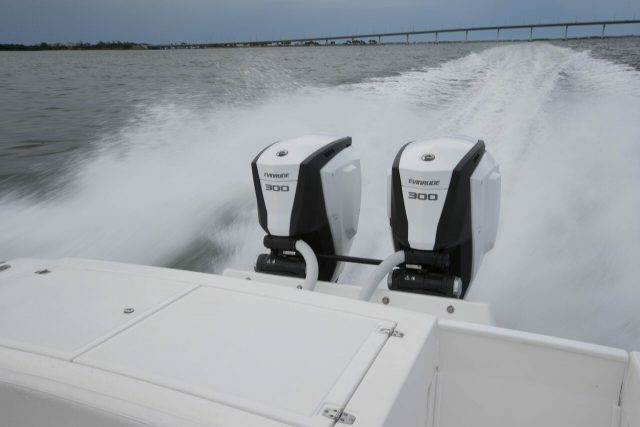 “I’ve always been impressed with the power and fuel economy of the Evinrude G2 E-Tec outboards on my Andros 32 that I run daily doing fishing charters in Key West, Florida.” said Capt. Rush. “This new iDock joystick is simple to install because the innovative steering is built into the motor. That means you don’t have noisy external steering pumps and the installation is so simple. A big, wind-catching, pontoon boat gave everyone a great example of how easy the iDock is to handle in tight quarters and less than ideal conditions. They also had a Scout boat for everyone to ride on. 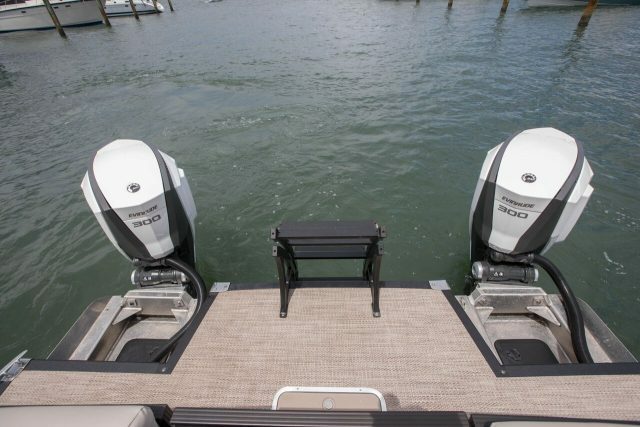 No more docking stress with Evinrude’s iDock joystick controls! 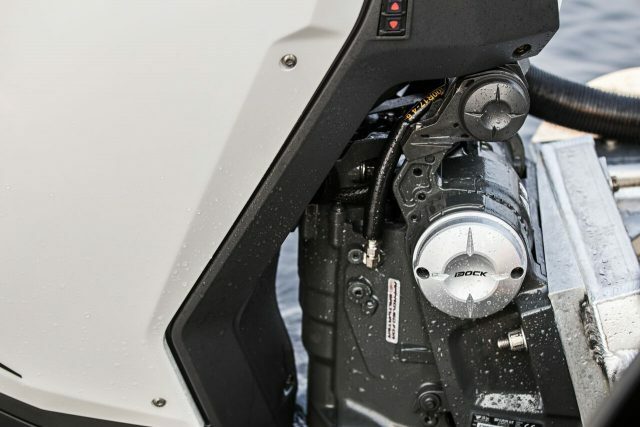 A fully integrated system, Evinrude iDock connects with the existing internal hydraulic steering feature of Evinrude E-TEC G2 engines, reducing cost of parts, removing clutter on the transom and freeing up precious storage space. 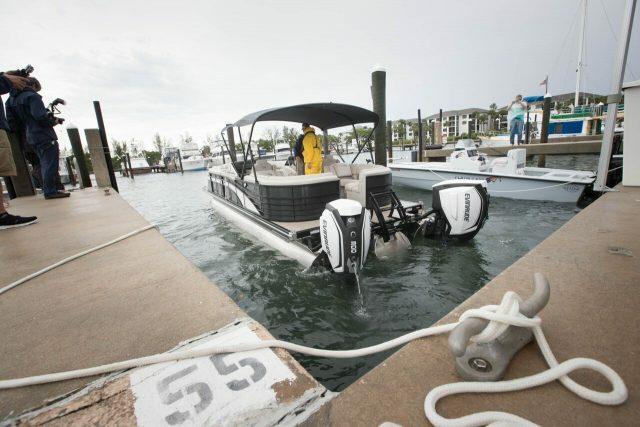 And, because it leverages existing E-TEC G2 architecture, installation time is minimized – iDock models follow the same installation process as Evinrude E-TEC G2 engines and typically requires less than one hour of on-the-water setup. 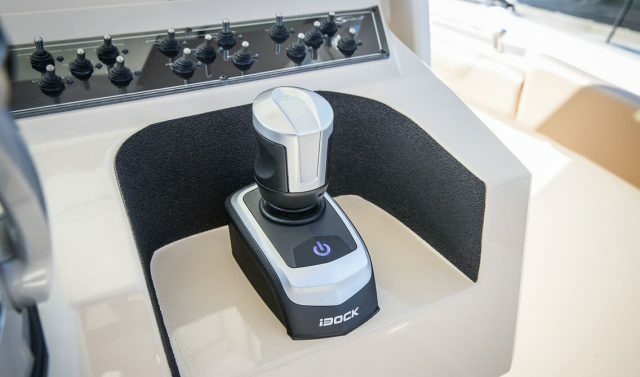 This allows Evinrude to offer the all-new iDock system for an unheard of MSRP of $5,999 USD for all iDock compenents which includes the joystick, module and hydraulic hoses. Evinrude E-TEC G2 iDock model engines are sold in pairs and will be available in Fall of 2017. Please see your authorized Evinrude dealer for further details. Learn more about the Evinrude G2 E-Tec engine on BD.